SPECIAL FEATURE: Aurora Aksnes is a 22-year-old Norwegian pop singer who’s been steadily gaining international popularity in recent years. 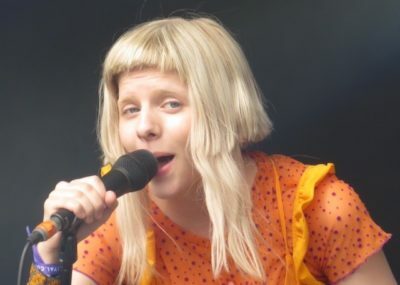 Calla Duffield is a 14-year-old fan and aspiring journalist from College Station, Texas, who got a chance to interview the singer known simply as “Aurora” before a concert in Liverpool this summer. Here’s the unabashedly starstruck Duffield’s account of the encounter, which offers insight into how and why Aurora has struck a chord with so many followers around the world. At the Liverpool International Music Festival last July, staffers led me to a secure area behind the stage where the performers’ trailers were located. I caught a glimpse of Aurora as we passed her trailer and cried a little to myself (I know it sounds cheesy, but she has that effect on me). Her assistant told us that Aurora wanted to sit outside for our interview because it was unseasonably hot that day and her trailer was sweltering, so we did an awkward dance around some folding chairs (or at least I did) before settling in to talk in the shade. In person, Aurora is slight and tiny—just 5’3”, like me. 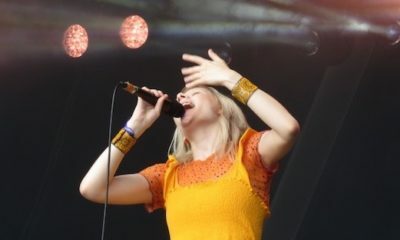 She was wearing a sunny yellow dress over layers of tulle skirts along with sunflower wristbands and sneakers (Aurora usually goes barefoot or wears flats onstage so she can run around and dance more easily). She has said she dresses the way she feels; I hope yellow that day meant happy! Aurora asked my name; I was almost too starstruck to move my mouth. While speaking, she gestures expressively, just like when she performs, with hands flying in the air. 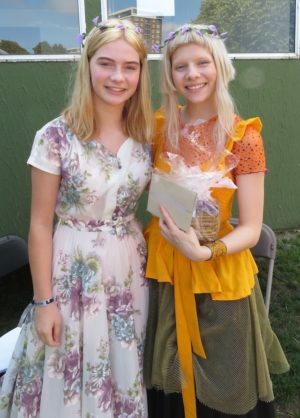 Her voice was soft and she was kind, and although I had just 10 minutes to ask questions (another interviewer was waiting and Aurora would soon take the festival stage), while we were talking, I felt like we were all alone. Before we met, I had watched many of her performances online: Onstage she projects a kind of Viking power, storming around like a warrior stalking her enemy. 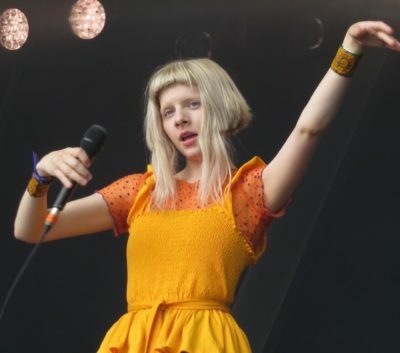 Her presentation is soulful but energizing, and looking out at the audience, Aurora seems to grab fans with her eyes, dancing with them even though they are far apart. Watching her is like watching a play: her lively pale face expresses the meaning in her lyrics, and her melodies and dancing amplifies it. I first encountered Aurora’s music when I was 12 while sitting on the floor folding paper cranes at my friend Gloria’s house. We were listening to Aurora’s Murder Song, which tells the story of a mercy killing. The haunting melody entranced me because of how well it fit the story. At first I was drawn to Aurora’s persona: a mix of warrior princess, wise and noble poet, and wild and free fairy, and to her strange style of dancing, of storytelling with her body—jerking her hands around to paint a picture in the air as she sang. Her songs weren’t about love or heartbreak, unlike most other songs on the radio; they were about love for the earth and humanity and navigating life. And I could relate to them because, being 12, I was far more interested in nature and the meaning of life than anything about romance. After that, I played and sang her music constantly and made sure my parents knew I would jump at the chance to see Aurora in concert. At the beginning of the summer, I learned from fan sites that she’d be performing at the Liverpool festival in July—around the time we would be visiting my grandmother who lives just outside of London. “Was there any chance we could go?” I asked my parents. They immediately confessed, much to my surprise, that they already had acquired tickets. And because I had previously expressed an interest in journalism, my mother, a professor of journalism at Texas A&M University, had been trying to arrange for me to interview Aurora. I composed an email that included a short bio, reasons Aurora should grant me an interview, my photo, and a few sample questions. I emailed it to the festival’s press office, and crossed my fingers. Just a few days later, I got my answer: Aurora said yes! My mom and I jumped around our kitchen screaming. Just a week after that, I was sitting inches from Aurora asking questions, posing for photos and even getting multiple hugs. I started off by asking about her theme for the show. “Everything”, she said — a very Aurora-like answer; with fans and reporters, she can be both playful and vague. I tried not to have any preconceptions of what she might be like, but her distinctive child/sage personality comes through very clearly in her music and in previous interviews. At a time when many people seem so hateful, I asked, what gives her hope for such a place? Queendom is also about Aurora’s feeling of connection to her fans, she said. “I feel that we are all family … Queendom is that kind of place, and kind of attitude, that we [should] have towards people.” To Aksnes, Queendom is about spreading kindness and compassion. What advice would she give to kids who might feel weird or out of place? Before leaving for England, I had asked Aurora’s fans on Instagram what they would want to ask her. This brought only one response: when would she be performing in Romania? Although her first language is Norwegian, she writes almost all her songs in English. Will she ever release the two songs she has written in Norwegian? “Maybe one day, because it’s nice to listen to songs without understanding the words,” she said, smiling and clearly referring to her fans outside Norway. Last and most importantly, I wanted to know, when is Aksnes coming to Texas?